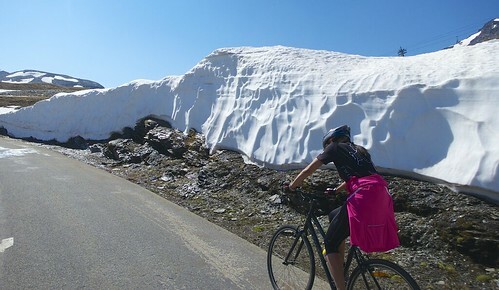 It was “1 jour, 1 col” day as part the Savoie/Mont Blanc Tourist Board’s excellent series of road-closed-to-traffic-bike-only days. See here for the official site. I rode it last year and enjoyed it so much that I just had to come back with the wife boss. 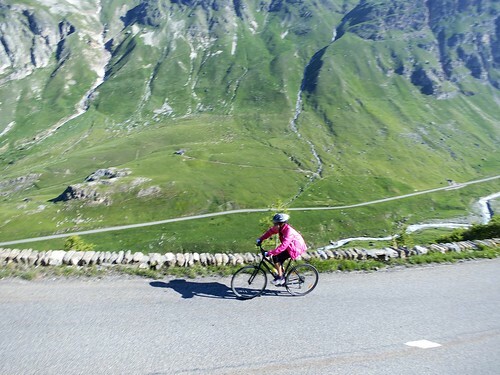 For maps, and profiles of both sides of Col de l’Iseran see here. We started from Val d’Isere as part of the offical 8:30 start. Not too many cyclists this early, but the road was closed on both sides for 5 hours and we saw a steady stream throughout the day. It is such a beautiful climb, and the weather was just perfect. So much fun riding up with my favourite person in the world. 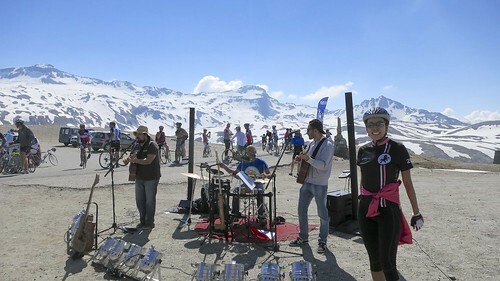 At the summit was food and music. The band was absolutely fantastic. On the descent we took a detour to a great lookout point to just enjoy the views. Overall, perhaps the best ride of the year. Bike-only day in paradise with my brave wife. What's not to love? I was there! Got the link from your site many many thanks a fabulous day. Climbed from the other side starting from Modane a truly fantastic 55k each way. Currently in Cantonal hospital recovering from operation to put four pieces of my clavicle back together with a metal plate after falling on a leisurely Sunday morning ride. Thank you to Divinne Sapeurs pompiers and all doctors and nurses here. There this Sunday Will. Have to thank you for your website. Fantastic work. Very inspirational, and great pics. We used it extensively when we did the Alps and the Jura last year. We leave tomorrow for another two weeks in the Alps. Our last trip [well, last trip was May this year and not blogged, so the last blogged trip]. 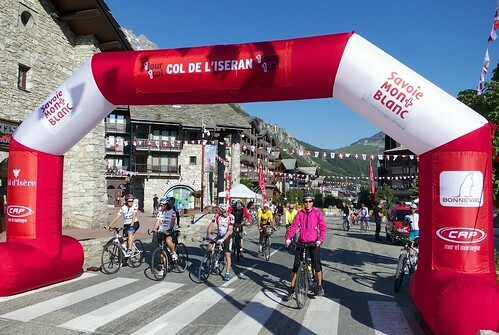 Did the Col de l’Iseran way back on 18 August 1961 ! We did not see any cyclists and no motorcyclists. Went from Lansleburg after doing the Mont Cenis from Turin. 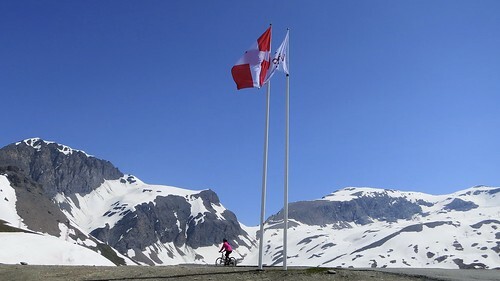 The ride up was fantastic, it was a gravel road then from the top down past what is now the big skiing area, we then had to do the Little St Bernard as we did not have any French money on us. John Lees in deepest Cornwall. Tout d’abord, félicitations pour toutes les photos : on sent qu’il y a du boulot ! Je souhaitais vous interroger à propos des profils des cols que vous publiez : est-ce vous qui les élaborez ? Si oui, avec quel logiciel ?